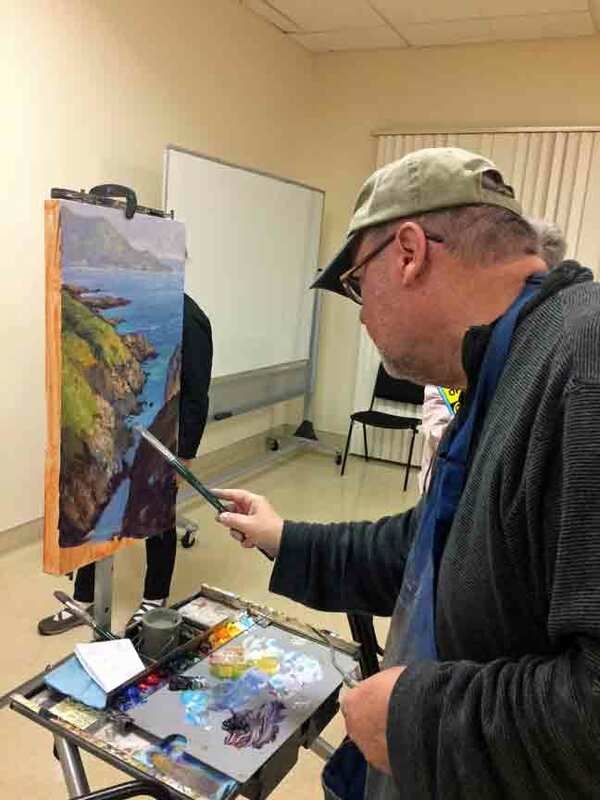 garrapata – Just Stop and Paint It! 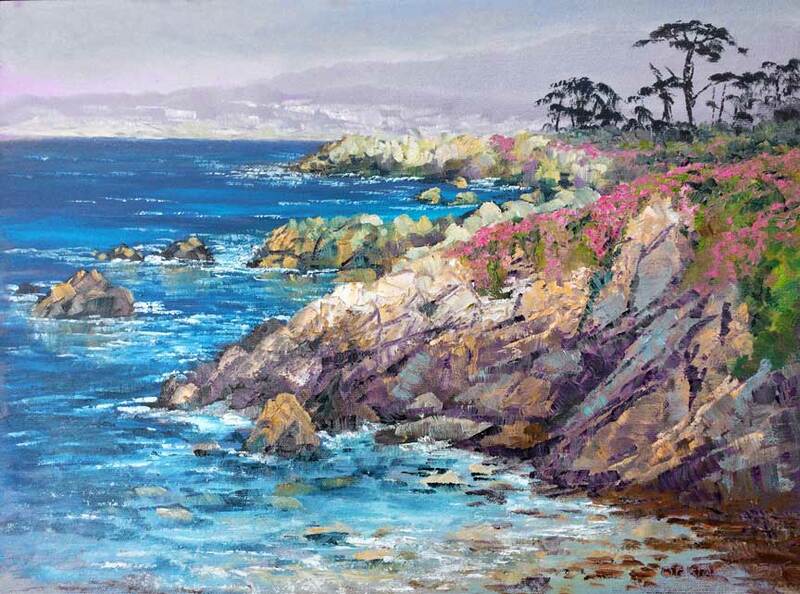 I headed to Monterey/Carmel around noon for about the 90 minute drive. After checking into my motel, I stopped by the festival around 6pm to have my canvases stamped. 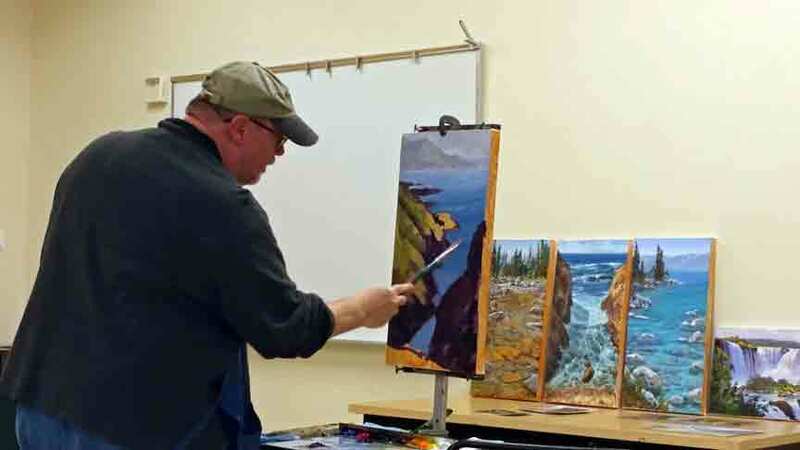 In plein air competitions such as this, you have several days to paint at least two paintings, which are then auctioned off. The festival coordinators stamp the back of the canvas to ensure all work is done in the two days allotted. 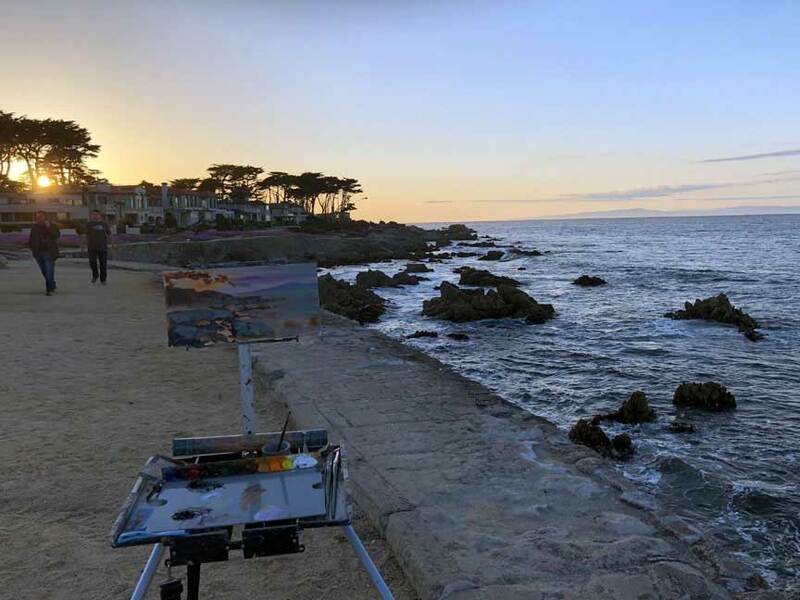 After having my canvases stamped, I headed to Perkins Park in Pacific Grove. My plan was this: Since I was having relatives from the Philippines coming tomorrow afternoon to visit, I figured I would start a painting here late in the day, and then finish it tomorrow afternoon where they could easily find me. After heading back to the motel to get cleaned up, I finished the day with a dinner at my go-to Indain Restaurant, Ambrosia. The next morning at the crack of dawn, I headed down the coast. The forecast was to be completely clear. 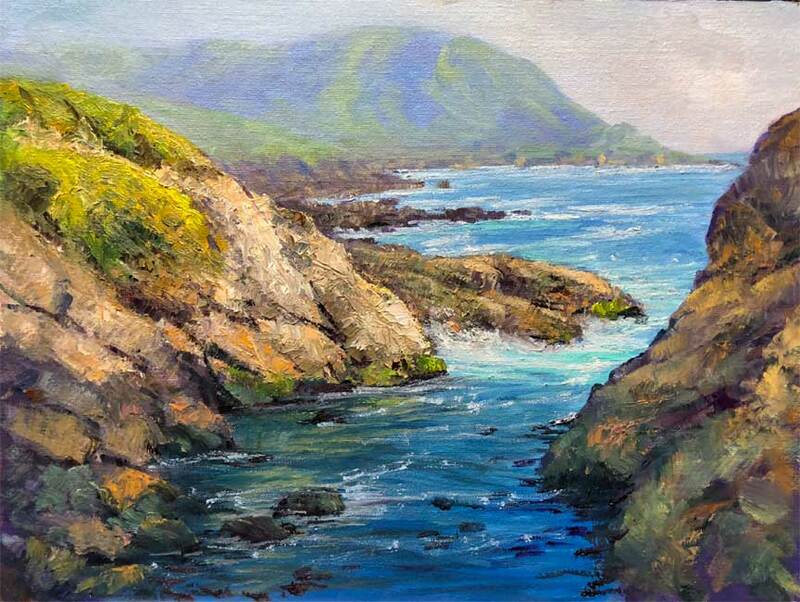 My morning plan was this: There is a specific cove I wanted to paint in the style of my recent “Vertical Water” series. 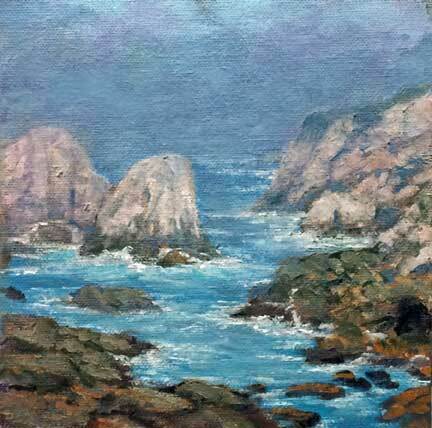 The cove is on the trail out to Soberanes Point in Garrapata State Park. When I got there, the entire area was closed and a number of crews were working on rebuilding the trails. I asked if I could go out to paint for a few hours and they said no. Catherine, now thats a serious painter! 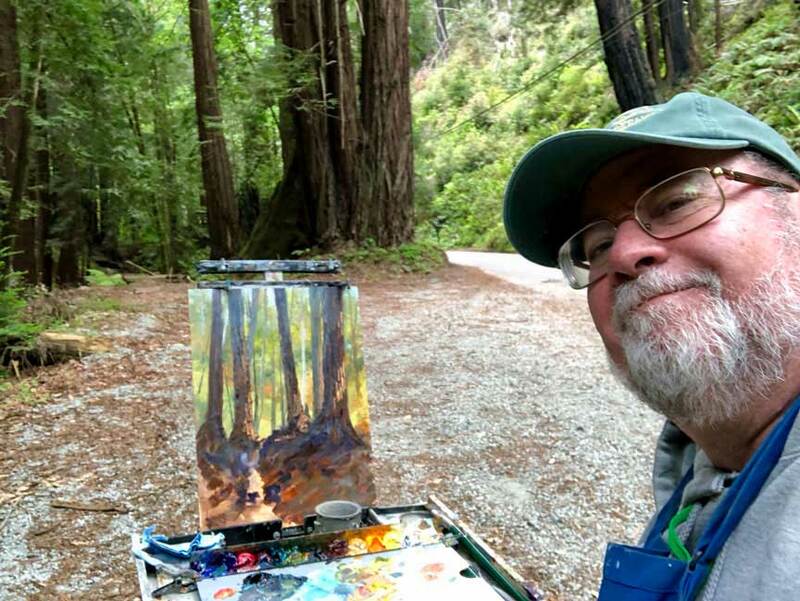 A wonderful place to paint! 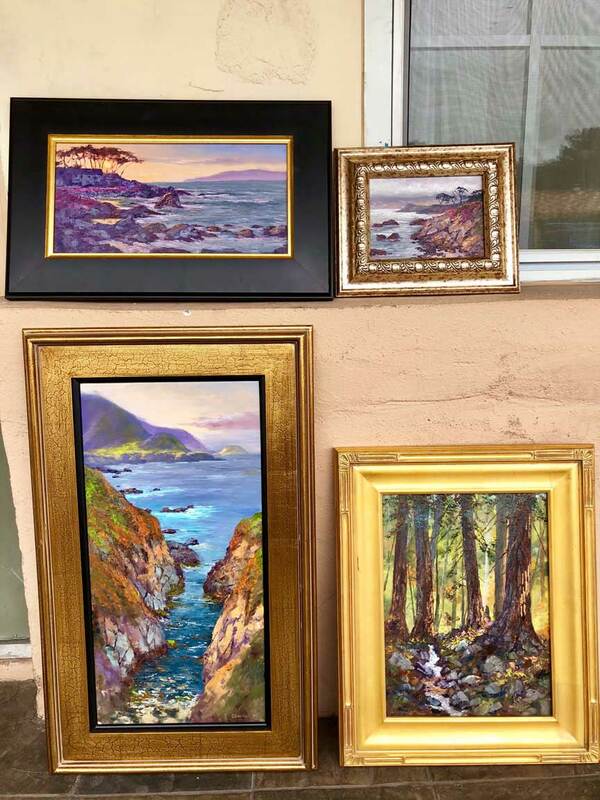 Prior to starting any other paintings, I wanted to touch up and frame the three ‘keepers’ I had, so hung around my motel in the morning doing just that. 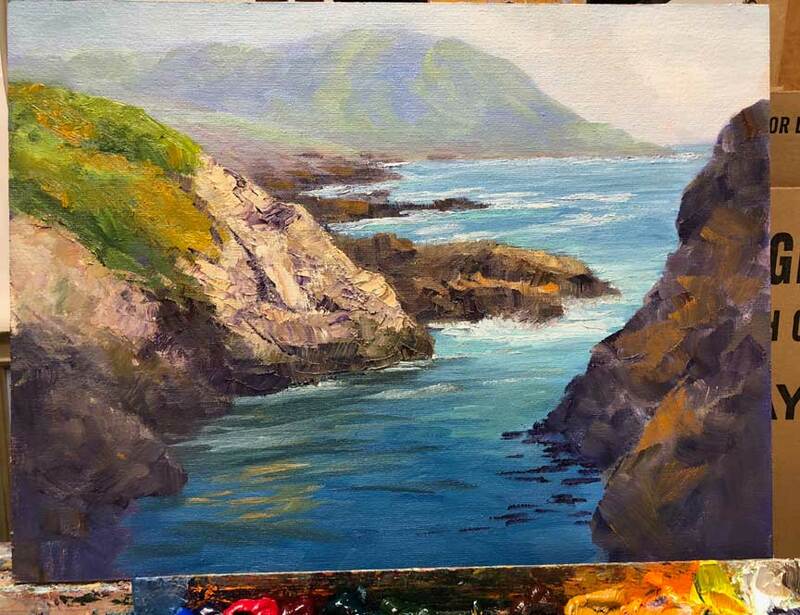 After lunch, I headed down the coast again to possibly do another painting. The pressure was off, however, as I had ‘three in the can’, so I just soaked up the atmosphere, scouted out places for possible future paintings, etc. After sleeping in Saturday and having a leisurely brunch with my in-laws, headed over to the festival. 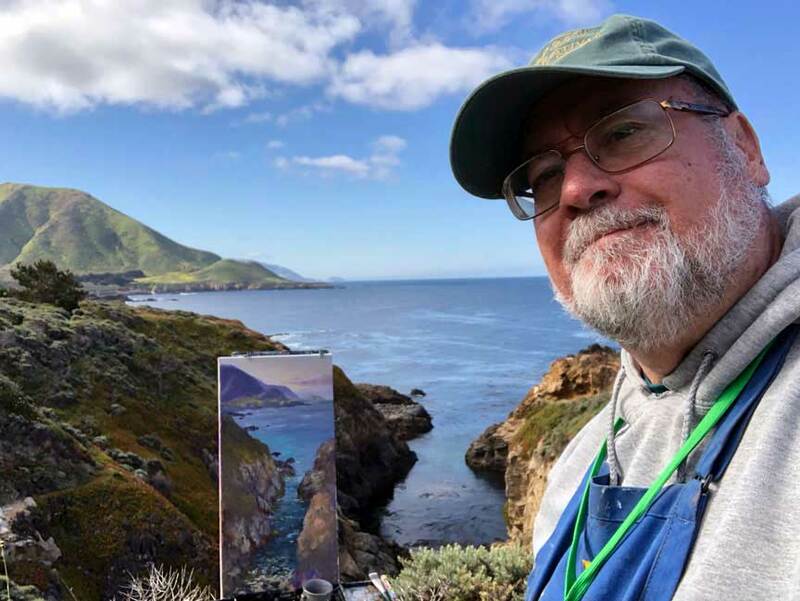 I was honored with the “Plein Air Magazine Award of Excellence” for the Vertigo! painting. 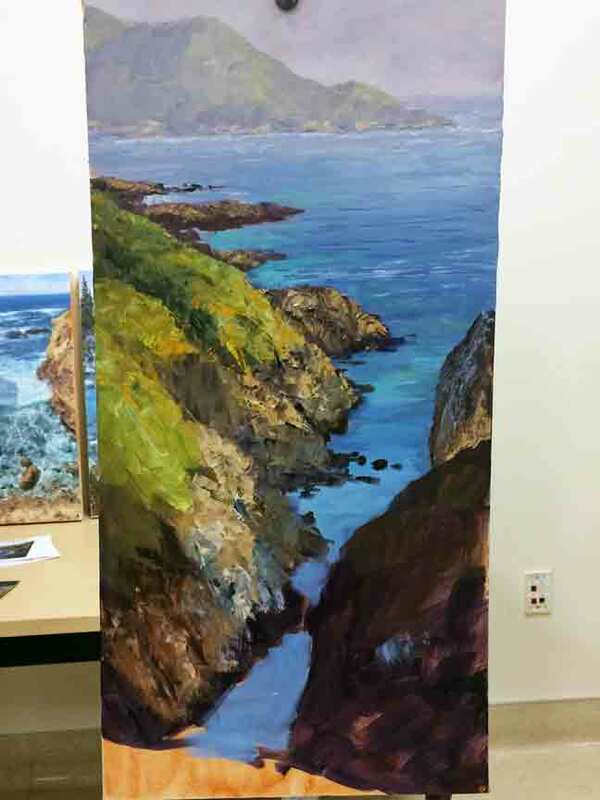 The Palo Colorado redwood tree painting sold at auction. By noon all my paintings had been sold. 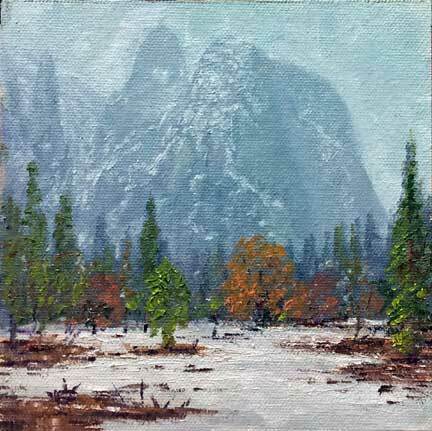 Normally we have to wait until the show is over at 3pm to pick up unsold paintings, but since all of mine were sold, a little after noon, I packed up and headed home. 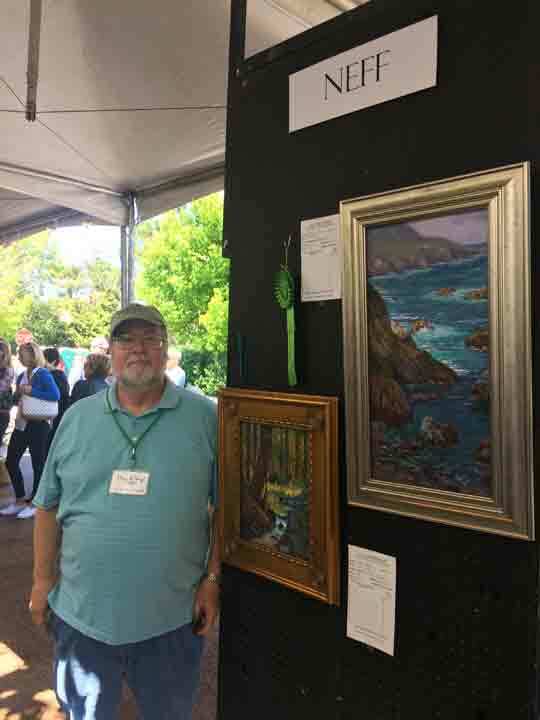 It was a great week with good weather, sold all my paintings, got an award, re-acquainted with fellow artists, and a little more tan! 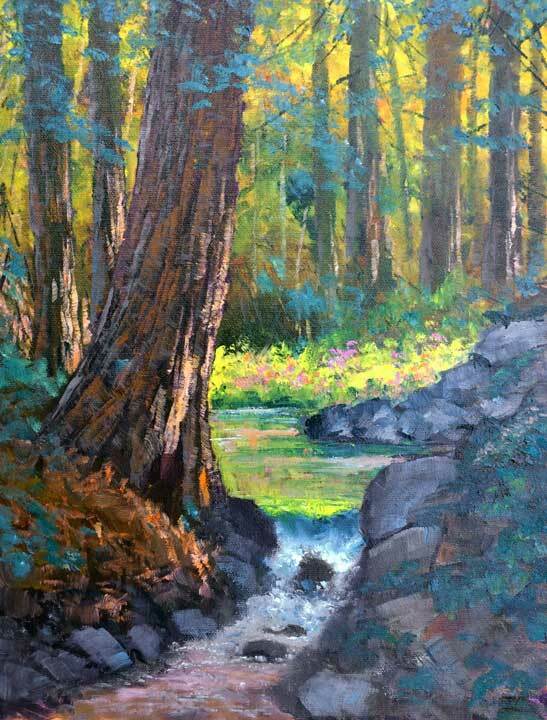 Next up is the Los Gatos Plein Air Show June 16-17! The waves come crashing in, pounding the narrow walls, rushing in and out creating thunderous sound. With sea spray in your face, there is nothing like standing on a bluff over the thrashing waves…especially in Big Sur, California! Nothing like momentum! First it was Kako-no-ike in Japan, then twice in the high Sierra Nevada Mountains with the Mighty Tuolumne. and Tenaya Lake; and now the California coast. This is the fourth ‘vertical water’ painting recently done, and now becoming a series. 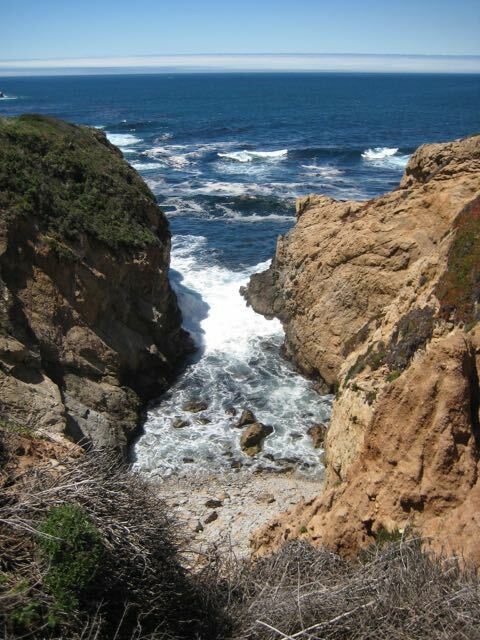 This narrow inlet is along the California Coast in Garrapata State Park. 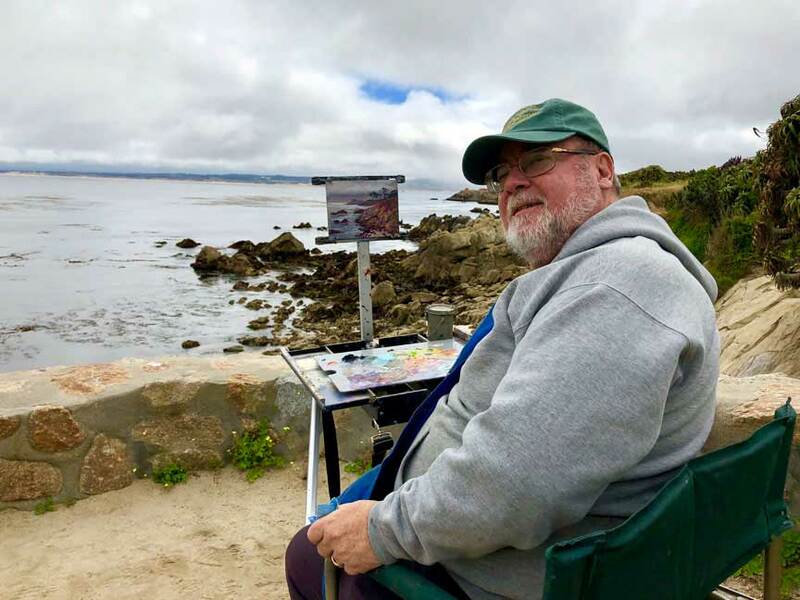 Just south of Carmel, and close to Big Sur, it is my favorite place to paint along the coast. 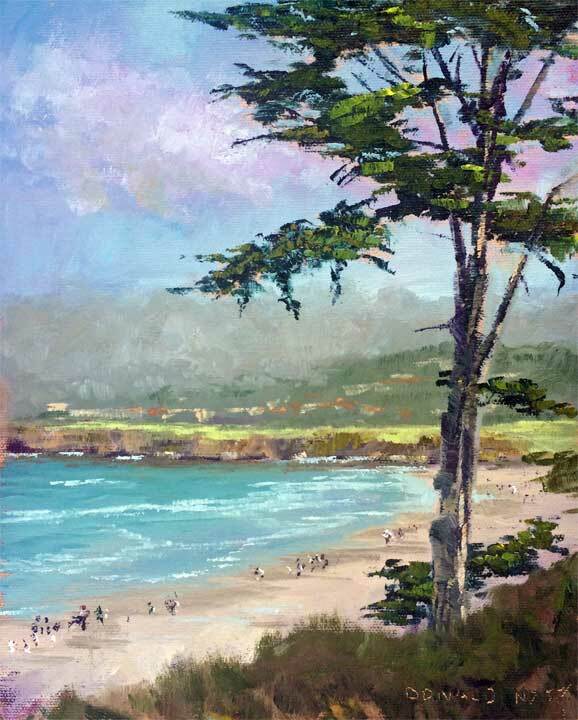 I usually do one or two paintings there for the Carmel Art Festival each year. 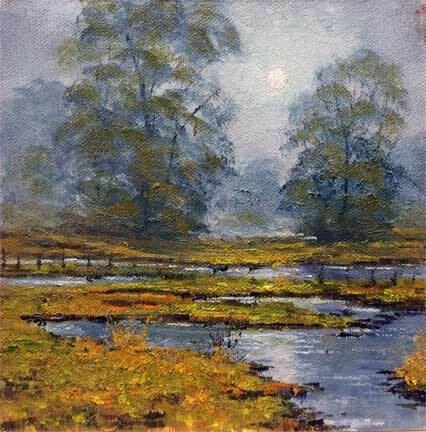 I painted this more alla prima (all at once), which didn’t take as long as the last two water paintings. Those last two, I let dry several times so I could glaze over the water. Below are a few snapshots of the progression. Click on each photo to see a larger version. Email subscribers may have to click on the above title to see them. I ran out of this size vertical canvas(12×24), so just bought three more. I still have a number of ideas for more vertical water paintings…stay tuned!